(L-R): Representatives of Tata Motors and Senior Management of Jaika Motors at the handover ceremony of Tata Tigor EVs in Nagpur. 3 phase AC induction motor mated with single speed transmission for better driving experience. Tata Motors along with its authorized distributor Jaika Motors Ltd., today organised ‘Fleet Meet’ – an engaging event for top fleet operators in Nagpur, to introduce the Tigor EV. The Company held a sensitization programme highlighting the benefits of this zero emission product and its features. 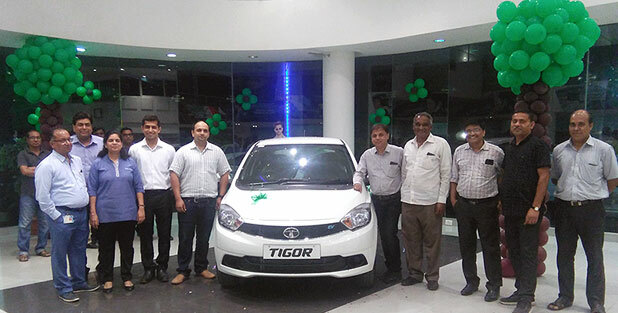 Tigor EV, which is a fully electric, zero emission, compact sedan marks the beginning of Tata Motor’s journey to boost e-mobility. Speaking on the occasion, Mr. Ashesh Dhar, Head – Sales, Marketing & Customer Care, Electric Vehicle Business Unit, Tata Motors said, "We are delighted to announce the milestone of our journey of driving electrification in Nagpur along with one of key authorized dealer Jaika Motors Ltd. We are confident that the people of Nagpur will appreciate and enjoy the driving experience. Tata Motors will continue to work towards offering environment friendly mobility solutions for customers. Speaking at the event, Mr. Kartik Kale, Director, Jaika Motors Ltd., said "We are thrilled to join Tata Motors to bring electric vehicles to Nagpur. We are confident about making a significant impact in the electric vehicle space with Tata’s Tigor EV and thus winning a significant market share."